Not to underestimate you lovely lot (never! ), but we’d guess that a sizeable number of our dear Roadburners aren’t too familiar with Rakta yet, which is natural, unless you’re a close follower of the Brazilian undergroun. Considering the amount of incredible bands making their way out of there in the past few years, we all really should be paying a bit more attention. Rakta, hailing from São Paulo, are one of the brightest (or, well, darkest, in this case) gems from that rich and growing scene, and we’re sure that by the end of the day on Thursday, April 11, this cat will most definitely be out of its metaphorical bag. Starting out in 2013, they have been prolific so far, with several releases to their name already, from albums to EPs, collaborations, compilations and singles, all of them offering a twist on their unusual mix of styles. Even after avidly consuming all of their discography, and as it often happens with the best envelope-pushing music, easy categorisation still eludes us. Post punk, death rock, psych or just good old noisy garage rock’n’roll are all little tags floating around in our heads, but these talented, restless women refuse to let any of them stick for too long. Their songs have and otherworldly, ethereal feel, yet they are grounded and hard-hitting, and before you know it, both your mind and your body will be moving to them. 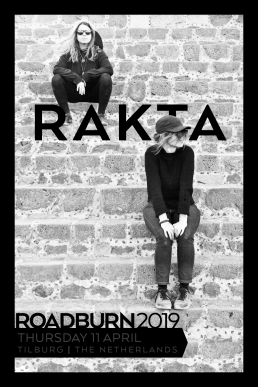 Rakta are a revelation waiting to happen, so be sure to be there when they play on Thursday, April 11.